The other day, I tried to ssh into a client and to my surprise, I couldn’t. Now if you are the guy in charge of managing macs and you can’t get into a mac that you clearly should be able to, you start asking yourself some questions. Long story short I used my magic hand and brought the mac back into the fold… There will be no black sheep running around. As always I like to keep my script in pairs (One to find and the other to rectify). I know there are other scenarios I haven’t accounted for but this works for me (One scene I want to look into is ssh connection failing when the firewall is enabled and set to block connections). (Again, I know there are other variation of blocking ssh but for now this solves my issue, I plan on building on top). As such, the script checks if ssh is turned on and if the sshd_config file exists; and if both are True, it sets the attribute result to Enabled and if not, Disabled. Now that we have and attribute setup, let’s set up a smart group to gather all the fallen. Now that we have our smart group, let’s load the ssh_enabler script into Casper Scripts. Make available Offline is optional but as the name says, it will run even if the client can’t reach the JSS. I am also adding an inventory update config so that I have an accurate report every time the policy runs. 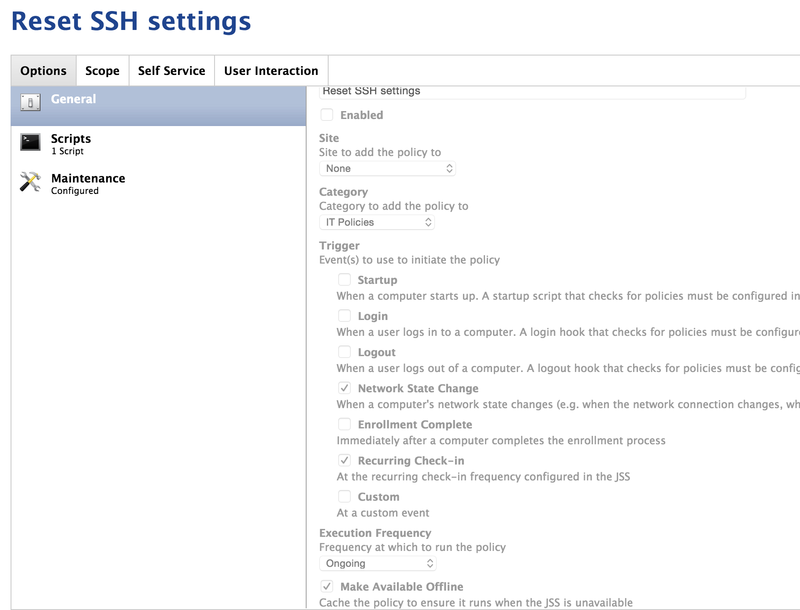 Voila… We now have an ongoing policy that will reset ssh on any clients that dares to fall into it’s scope. While this setup will not address everyone’s needs, I am hoping some will find it useful. There are many scenarios that can be added here; some of which I will explore such as ssh status in relation to the built-in firewall settings been enabled; or ensuring the needed user is allowed to ssh but for now this works. The scripts are available on my github. Hi, I don’t see the script? Sorry if I’m blind! Thank you for your sharing. Hi, there is a link at the end of the post, the scripts are on my github. Hey for some reason the status script is reporting a false positive any idea why? Can you send me a screenshot. 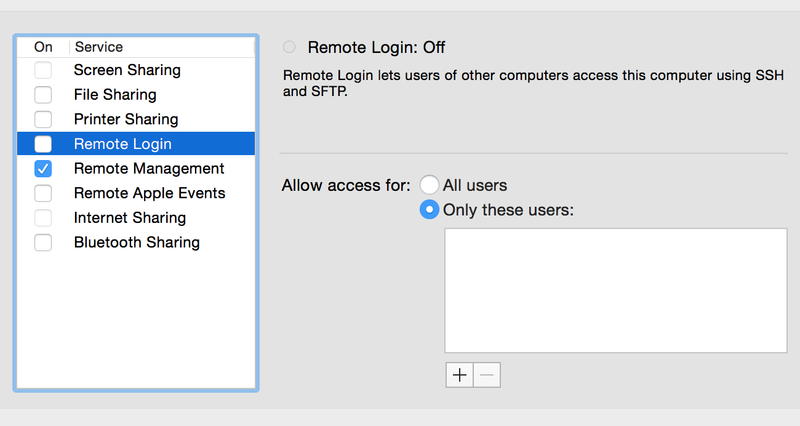 While the script looks for the most simple SSH triggers, there are many other possible ways to prevent a successful connection such as the use of ssh keys. Can you walk me through the procedure for adding the relevant Extension Attribute? In your JSS under Computer Management, there is the option for Extension Attribute. Once you have that loaded, load the next part of the script into the scripts section also found in Computer Management.